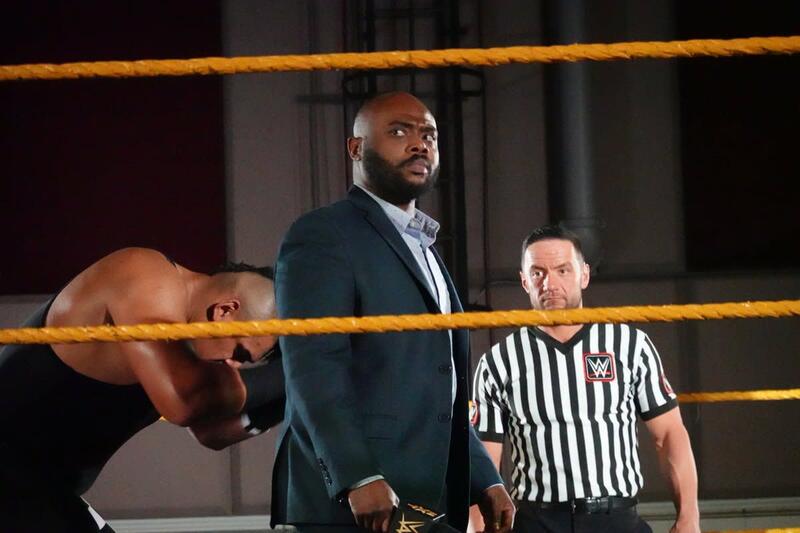 Former EVOLVE and Ring of Honor manager/independent wrestler Stokely Hathaway debuted at NXT's house show in Tampa, Florida on Friday night. Hathaway went by the name "Court Moore" and managed Babatunde Aiyegbusi, with Aiyegbusi defeating Nick Comoroto. Hathaway spoke on the microphone before the match and introduced Aiyegbusi as his newest client. WWE announced earlier this month that Hathaway had signed with the company and reported to the Performance Center. Robert Strauss (formerly Robbie E in Impact Wrestling), who also joined the Performance Center this month, debuted as a manager at Thursday's NXT house show in Sanford, Florida. He managed Saurav Gurjar (w/ Rinku Singh) on Thursday and Riddick Moss on Friday. Mendoza won with a scoop cradle driver. A rotating stunner got the win for Catanzaro. Dijakovic hit his Feast Your Eyes torture rack into a knee strike to win. Great matchup here and a preview for the fatal four-way title match at TakeOver: New York. Shirai and Sane had to square up and wrestle each other as the other two were on the floor. Baszler was able to score the pin on Shirai after Belair had put her down.